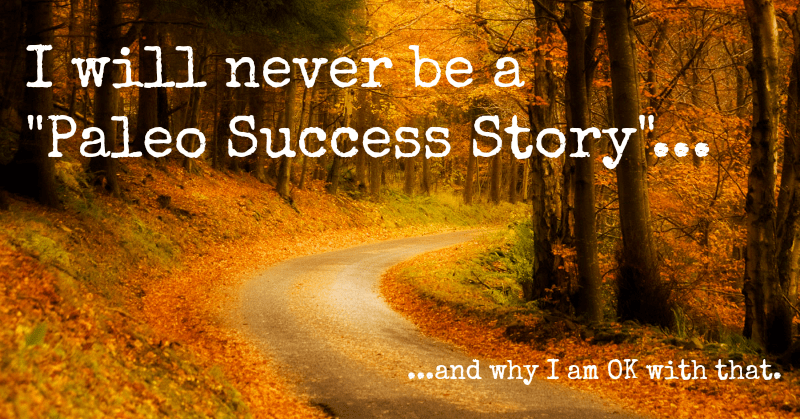 If you are looking for a “Paleo Success Story,” you won’t find it here. If you’ve landed here because you Googled something about paleo and curing Crohn’s disease, then I am sorry to tell you that this post is going to disappoint you. I don’t have any before and after pictures, and I’m not going to be featured on anyone’s podcast, TV show, or book to share some incredible transformation story. But that doesn’t mean that paleo has failed to help me. Quite the opposite, in fact. I have experienced a tremendous improvement in my health since I began eating this way. My inflammation markers are way down, my colonoscopy results show only mild Crohn’s activity, and the severe iron deficiency anemia that used to require literally life-saving blood transfusions every couple months is now managed with just iron infusions a few times a year. Probably most significantly, when I was struck with a drug resistant clostridium difficile (c diff) infection this summer after taking antibiotics for an unrelated condition, I was strong enough to be able to continue functioning reasonably well rather than being completely debilitated by it and eventually beat it with help from a friendly gut bacteria transplant. This is true for all of us, but especially for people like me with chronic conditions like Crohn’s disease. It isn’t a virus you simply get over and you don’t “beat it” like cancer. As with other chronic autoimmune diseases, there will never be a point when I am “Crohn’s disease free.” The best I can hope for is remission, and given the damage that has been done to my digestive tract from years of inflammation, harsh medications, gut dysbiosis, and surgical interventions/complications, even that doesn’t mean much for me. I frequently describe my health status as a “work in progress.” All I can ever say with certainty is how I feel at this very moment. Though most of the time that I can describe how I feel as “good” or “very good” or even “fantastic”; I never know when I will have a day that sends me to the toilet a few extra times, or when I’ll have a bout of embarrassing gas, or when my insides will start to feel all topsy-turvy or crampy for no apparent reason, or I’ll just get tired and need a nap to get back on track. Sometimes I can trace these bumps in the road back to some suspect food, or a stressful day, or a change in routine… but usually I have no idea what I did that was different than any other day. I used to get really stressed out about that, racking my brain and pouring over my journals to figure out what I did wrong… until I realized the self examination and pressure I was putting on myself was only making things worse. So I have learned to let it go. I have stopped trying to get to the destination of perfect health and instead accepted that I’m on a journey. Like any journey, there will be easy patches and difficult ones. There will be surprises. I will make mistakes and learn from them, and sometimes I will do everything right but still hit bumps in the road. Confession time. I don’t actually think the “paleo diet” is right for everyone – at least as it has come to be defined in the popular culture. Many people can consume dairy and do very well on it. Others are totally fine eating legumes and some grains, especially if they are prepared traditionally. I’m not even convinced that gluten is the poison some paleo-folks make it out to be. It may be a bad thing for me to eat, but I suspect there are people who have the genetic makeup or perhaps the right combination of gut microbiota to break it down and have no ill effects at all. I actually started this whole healing-with-food journey back when I discovered I had some unusual food allergies that required me to cut out most processed foods. From there I went to the Specific Carbohydrate Diet (SCD) and then on to the Paleo Autoimmune Protocol (AIP) as outlined in Sarah Ballantyne’s books (though she hadn’t written them yet – I was still piecing together all the vast information on her blog!). At the time I started AIP, I also discovered that some high FODMAP foods triggered digestive distress and spent some time eliminating and then reintroducing those foods. 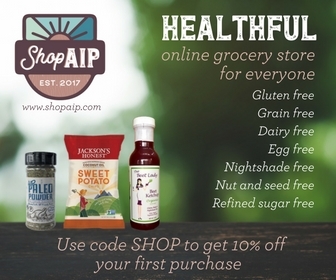 Eventually, I was able to reintroduce most AIP foods (eggs and nightshades are OK; nuts are problematic in anything more than small servings) and most high-FODMAP foods (most cooked vegetables are fine, but apples still give me a gut ache and lactose is a definite no go) and continued to keep my Crohn’s from flaring up again. But I also found myself developing different health issues. My energy was low and I had trouble keeping my weight up, which is a big deal for me because I’m already usually underweight and really self conscious about it. I look back at photos of myself over the last few years and I’m dismayed that during some of the times when I was actually feeling really good, I didn’t really look that healthy. Of course, that only got worse when I was struck with c diff and lost even more weight. Now that I am past that setback, I really want to get back to looking as good as I feel… and I’d like to pack on a few additional pounds as insurance against future setbacks. To that end, I’ve started making a concerted effort to get a much higher portion of my calories from carbohydrates than one would on a traditional paleo diet, including from gut friendly grains like white rice and soaked gluten-free oatmeal a couple times a week. The weight gain is still slow, but I’m starting to turn this ship around. No, I won’t be a paleo success story, because I don’t even eat a diet that most people would recognize as “paleo” any more. Thankfully, there is no official membership card! And yet, I still feel this weird twinge of something like guilt for deviating from the template that I have identified myself with. Even though my rice, oatmeal, and home baked gluten-free bread makes me feel great (and tastes amazing), I still feel like I should keep that a secret – like I’ll be outed in the “paleo community” as a fraud. From this point forward, I refuse to feel guilty or keep the way I eat a secret from anyone. After all, guilt and secrecy have no place in a healthy relationship with food. The ever present danger for those of us who are using food as part of our healing strategy is that we end up letting an awareness of what we do and don’t eat become an obsession. Where is the line between eating a healthy diet and disordered eating? What is the difference between restricting and manipulating your diet for a health benefit and restricting and manipulating your diet because you are un-healthily obsessed with food? There is even a label for this disorder – orthorexia nervosa – and it is recognized by the National Eating Disorders Association and mainstream health organizations like the Mayo Clinic, though not yet listed in the DSM as a true mental illness. Recently, a relatively prominent paleo advocate suggested that many people following a more restricted form of the paleo template for autoimmunity were suffering from an eating disorder. A lot of my peers in the paleo autoimmune community were upset by the comments, but I am glad the issue got us talking and thinking about how we find balance. My friend Dora of Provincial Paleo wrote about the importance of emotional support on AIP. Jo of Comfort Bites Blog wrote about the issue too, including how letting worry about food take over your life can be a warning signal of orthorexia. Tara of Paleo Cajun Lady wrote about finding emotional balance even when you have a setback like a flare up of your autoimmune disease and may not have real life emotional support. Finally, I just love what Martine of The Paleo Partridge said about using mindfulness to find balance in a post awesomely titled “You Better Check Yourself Before You Wreck Yourself”. This post started out being about how I am not a paleo success story and never will be because my health still isn’t perfect and I have no “before and after” photo to share. But in the end I have realized that it really IS a success story. Starting to eat this way – whatever we call it – has opened my mind up to an entirely new way of thinking about health and the active role I can take in in maintaining it rather than letting my disease happen to me. It has also connected me to a whole community of caring people who are my virtual and real life support – bloggers, social media friends, and even people I’ve had the privilege of meeting in real life. These people continually remind me that we are all on a journey and accepting that fact is indeed a success story. 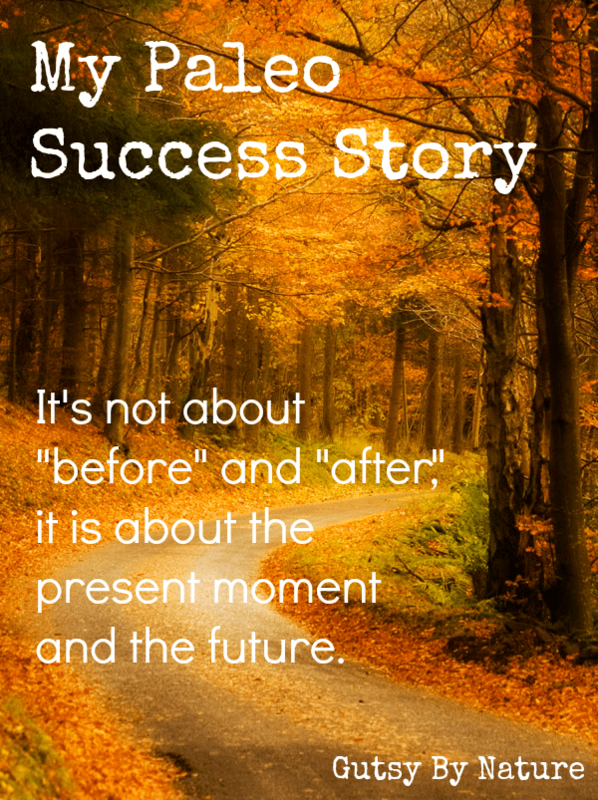 It’s not about “before and after,” rather it is about the present moment and the future. That is success. Thank you for sharing this! I also struggle with Crohn’s and the seemingly random flares that accompany it. I haven’t reintroduced any foods yet, but I feel so much better than I used to, so I’m happy with that success!! Hi Jaime, I found your website while researching diets for Crohn’s to help my friend Tracey whose medical/surgical history is partially similar to yours (although I don’t think she has had C diff / microbiota transplant nor anemia). Her first surgery was age 21. She started receiving SSDI for Crohn’s at age 23 — at age 48, with multiple surgeries behind her, and needing additional surgery to resolve strictures, she is still on SSDI. I have printed a number of your blog articles for her, especially the success stories, to give her hope that by being vigilant with her diet, she has more control over her disease progression and symptoms than she ever thought possible. I have my own unusual digestive challenges resulting from 2 congenital esophageal strictures (causes difficulty swallowing; first food impaction age 10) and eosinophilic esophagitis (an inflammatory allergic condition of the esophagus that also causes difficulty swallowing). Both conditions were not correctly diagnosed until age 63 through a series of endoscopies. Plus more recently have developed post-infectious IBS-C and SIBO from several bouts of gastroenteritis. So I truly understand the dedication and commitment it takes to discover and follow a healthy diet that keeps symptoms / flares to a minimum. Thank you for sharing your experience through your blog. It is an inspiring example that diet matters — a LOT, progress IS possible, and that people need to take back power from the “drugs-and-surgery” model that most doctors offer as THE ONLY option. Barbara – Thank you so much for taking the time to comment. I am sorry I didn’t reply earlier… active blogging has taken a backseat this spring as most of my spare time is focused on working on Nutritional Therapy Practitioner training. I am glad my story has helped you and your friend and is a great reminder to me of why I am putting pursuing this training! Thanks for this article. I have only recently started on the AIP diet (one month in!) to try and counteract scalp and guttate psoriasis and this is the first article I’ve read that doesn’t just praise Paleo/ AIP to high heaven and insist that it is the only way to recovery. As a newbie it can really be daunting to read about all the success stories online, and how completely committed and strict many bloggers seem to be about what is healthy/ permissible. I was already worrying about the possibility of ‘failing’ (not getting better) and worrying about why that might be, and your article has reminded me that my journey is my own and my healing shouldn’t be prescribed by the experiences of others.